Vienna is a fantastic city with an alluring history and breathtaking sights. Once you are here either with family or friends, don't miss your chance of visiting the world's most beautiful theater - Vienna State Opera House. Prominent performances worth critics' positive reviews are demonstrated here! Graceful look, unique architectural solutions of ancient Baroque religious building Karlskirche fascinate tremendously. 8Rental has entered the market several years ago and has already placed itself on a dominating position on the list of entire Europe's best car-rental companies. 8Rental minibus rental with driver in Vienna is our most commonly used service as it suggests booking a spacious minivan, accommodating your family and providing comfy transportation in Austria. However, this is not the only service our company is offering to our customers. Our chauffeur and coach hire services have been highly demanding. Don't lose time, book your quote right away! This service has made the purpose of achieving the highest customer satisfaction level making positive steps towards it. Providing its clients from all over Europe with chances to order a chauffeur driven luxury vehicle on a profitable basis, 8Rental is only fastening its position in the industry. Whichever plans, intentions, preferences clients may have concerning cars and chauffeurs, this service will provide them! Our primary focus is to provide our customers with a service, which exceeds your expectations. Every customer is seen as a part of our company. We believe in the relationship that we build with every customer through our approach to each of the requests. 8rental focuses on long-term relationship with our clients, and with every minibus hire with a driver we expect our customers to enjoy their trips and always come back to us. Our team of the staff consists of high-level professionals who are there to support customers'queries. 8Rental service of minibus rental with driver in Vienna offers diverse minibus models in excellent condition to satisfy any client's expectations. Once your family or close friends are in magnificent city Vienna, you will need a means of transportation that has a large comfortable cabin. Elegant Mercedes Viano features a smart design packed with 4-8 comfy passenger seats. It's equipped with everything necessary for long group journeys, including tinted windows, seat belts, reading lights, armrests, CD/USB players, free fuel, air conditioning, air suspension. Another option is Mercedes Sprinter VIP, which is meant for larger groups of passengers. It provides enough space for over that 24 passengers! It is a gorgeous vehicle enriched with not only luxurious exterior design and aircraft-style seats with armrests and seat belts, but also a series of other amenities you will adore. 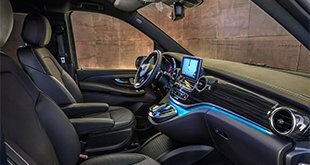 These are seat facing illuminated tables, central heating, and air conditioning, built-in audio system and CD/DVD/Stereo radio, air suspension, and carpeting. Expensive leather interior trim along with complete specs of this minivan make it an excellent choice for business delegations. Ask for a price and tell your specific requirements. All that you need for this is sending a quote, getting an initial proposal and confirming it to hire a chauffeur-driven premium minivan. Other not less luxury vans with a driver are offered to clients' selection. Highly qualified experienced chauffeurs of 8Rental service will guarantee safe driving in Vienna. If you hire a minibus in Vienna with licensed chauffeur, for the whole period of your staying, you entrust your time and safety to our service. 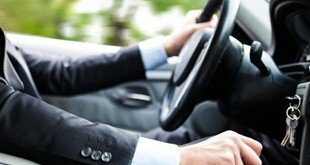 Our clients can choose English, Dutch or French speaking drivers depending on their convenience. We promise not to take it for granted! Rent a minibus in Vienna with a licensed driver from a well-known supplier in Europe and go long distances without the hustle and bustle! Get the best of Vienna with 8Rental!